not very exciting, the music by falcon is quite good though. the 2d gfx are on a technically high level, but quite repetitive. Get yourself a projector and a huge white wall. Play this. Play it again. Keep doing that until the damn thing breaks. Too bad this design formula became such a cashcow for future pulse/sunflower/haujobb/younamehere products. This demo Rulez. Fantastic soundtrack by Falcon. And very good code by Unreal. Great !!!!!!!!!!!!!! fantastic music by... Portishead: Numb. So not only Shaman rippin', just 2 make things clear. I demand a win port now! a very good demo from pulse! it's quite infamous, ghave no idea why. as i rememeber the last good pulse contrib. Great demo by the amiga gang and Pulse! Excellent graphics and design. awesome visuals and nice soundtrack. The music seems to be a ripoff(?) of the commercial tune "Numb" (IIRC) by Portishead (it's on the album "Dummy", Track 7). Nevertheless a lesson in art, design and atmosphere. One of my favourite pulse productions. The music is *NOT* ripped. I'm quite a big Portished fan, and have that very album - the track is not even close. Some of the samples sound the same, and I'd say the track definitely inspired this piece... but to call it a rip is a bit much IMO. Anyway, great demo! Only managed to run it once or twice on my machine back then, after that for some reason it would crash randomly. Nevertheless, awesome gfx / music / design. 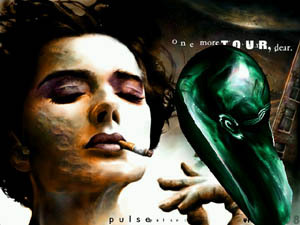 I think this is tied for first place with 72ms as my favourite Pulse demo, can't believe it only has 15 comments. a nice tour, even if a bit too static. Packer is PWMLITE and I did a patch so it runs on non-MMX CPUs. Nice, haven't watched it before. rulez added on the 2009-06-05 21:33:10 by ɧ4ɾɗվ. Well, tooooooo short! Should have a dope included, to feel more the power. One of the most impressive graphics work in a PC demo. Outstanding job Visualice (and the rest, of course)! the credit pics alone are mindblowing. back in 98 this was one of the demos that i though was quite impressive. really awesome 3d work and astonishing graphics. deffo not a rip, tho! I think this is actually quite a poor demo. The first half is basically a slide show, the rest has some pretty meh scenes and a few good effects. Visualice overdose! Good music + some really advanced effects! A bit too mish-mashy on the color department here, not all that good looking. Lots of cool individual elements, but they don't come together too well. perfect demo. supercool visualize gfx, great 3d (for it's time) and fitting track. I'll take that back. I mean, it's kind of a mess, but I feel like just chalking that up to esotericism. Product of its time. I love the soundtrack, overall.. very CNCD experience. page created in 0.021285 seconds with 15 queries.